« When is ‘cold’ too cold? 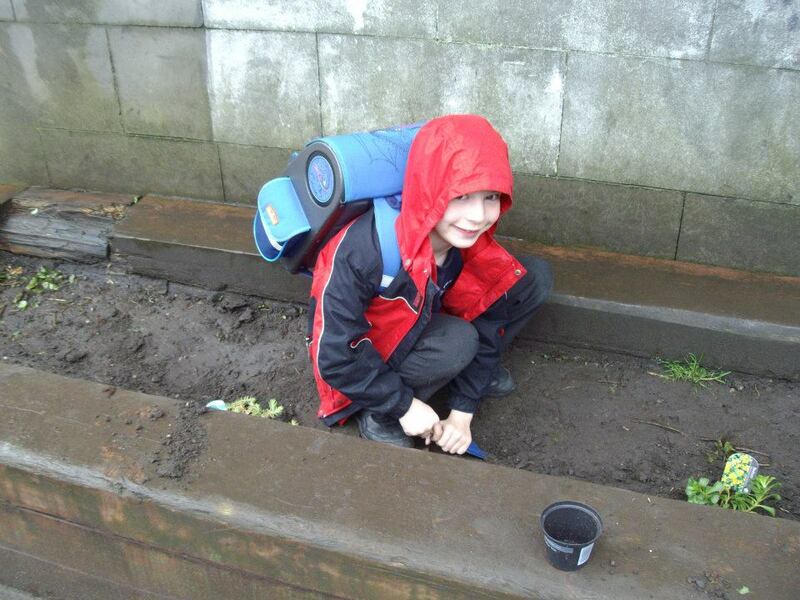 I would like to share with you some pictures of my children planting meadow plants in their own school grounds. Normally we go out to a nearby park for our workshops activities but this time I thought we would do something to brighten up the school. The outdoor area is predominantely tarmac with only a few plant boxes and no real garden space. Most of the boxes are unused. 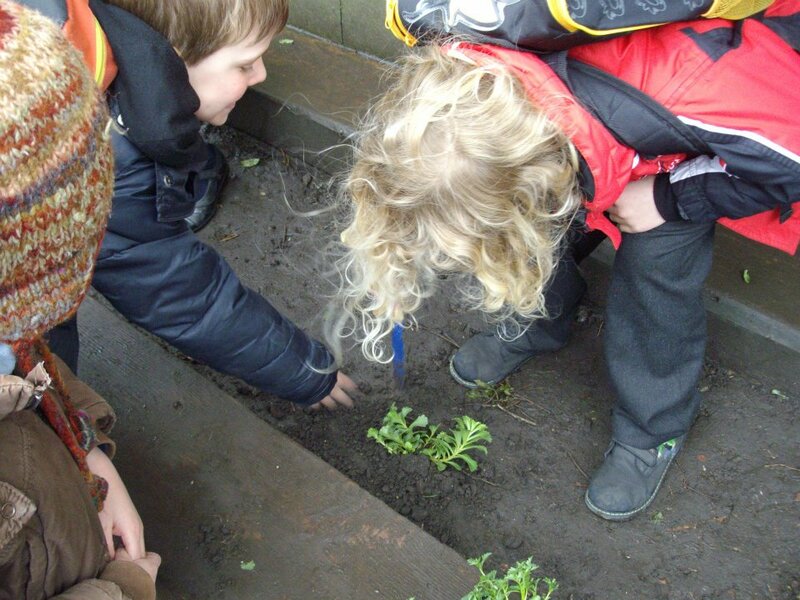 I thought I would get my nature club planting a meadow to encourage wildlife into the school and involve the other children at the school in nature and outdoor activities. During the planting the weather was wet and cold yet the children, all aged between 5 and 7 years of age worked brilliantly as a team and even helped weed the box before planting. They helped each other dig a hole big enough for each individual plant and decided where they would go, carefully patting the soil down around the plants. After discussing this for a bit the children decided that they, as ‘nature club’ would take charge of the meadow box as a group to ensure the plants were healthy and also put signs up in the box such as flags telling the other children in the school what it was, why it was there and how to look after it. One boy even decided he was going home to make a flag to stick in the box that evening! Now that is pride! What are your thoughts on making schools greener -what are your own ideas? 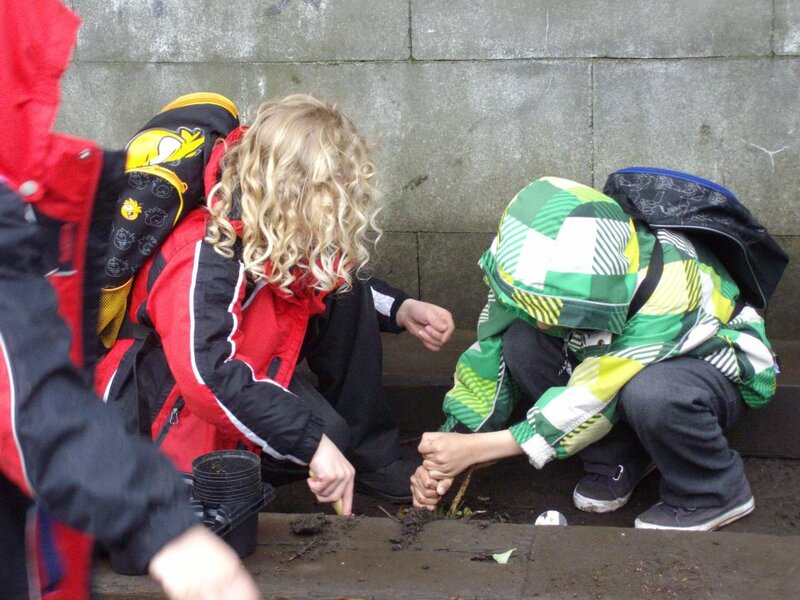 How can after school nature clubs have an effect on in school practice? Any thoughts you have would be very welcome! Many thanks for reading my blog! I hope the next project is in lovely summer sun! However they all look so happy planting in the rain. Keep up the good work. Haha! Yes well the sun always shines if the children are happy! Hopefully we will have some lovely meadow flowers blooming soon! Will keep you posted! I live in a very lush, green area of Washington state. Recently I traveled to New York City for an art education conference. There is not much vegetation there, not even weeds growing in a sidewalk crack. When I went to a park that had tall meadow grasses I felt renewed! I think adding some plant life to the school will have a huge impact! I hope you’ll post a photo of the signs the kids put up! That sounds like fun! Perhaps rip stop nylon would be good for the banner material as it holds up well outdoors. You could cuts small slits to poke sticks and leaf stems in for attaching the natural materials. Thats a great idea- thank you! I think that may be an activity for my next workshop! Thanks for your advice!